EU politics: Japan warns UK not to leave "Europe"
On the front page of the Sunday Times today we have a perfect illustration of the paucity of the debate on Britain's membership of the European Union, and the effect of the skewed reporting by the media. Under the headline, "Japan warns UK not to leave Europe" we are told that the Japanese government has issued "an extraordinary warning" against Britain leaving the EU, hinting that 130,000 British jobs could be at stake if the UK pulls out. This is in a memorandum submitted to the FCO as part of the "balance of competences review". It warns that Japanese companies invest in the UK because they see it as a gateway to European markets. Up to 1,300 Japanese firms with British outlets could review their position if Britain does not continue to play a "major role" in the EU, the submission warns. 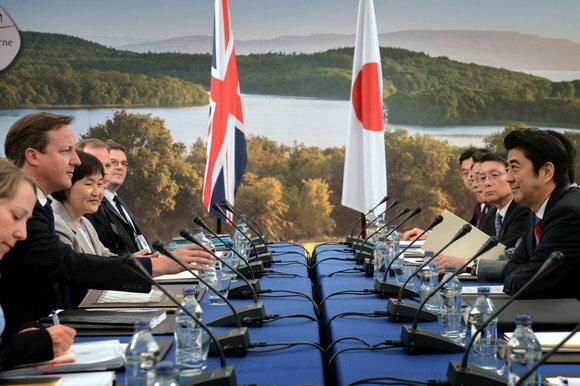 "The government of Japan expects the UK to maintain this favourable role", it says. Crucially, it then adds: "We have taken advantage of this occasion to express our expectations ... If the UK leaves the Single Market, countries investing in the UK and exporting to the EU would have to pay tariffs, and that is not good news". And there is the rub. In leaving the EU, the UK does not necessarily have to leave the Single Market. This membership can be maintained through membership of EFTA and the EEA. The Japanese position is ill-informed and its intervention ill-considered. It should know that this is the case. As an external country, therefore, it has absolutely no business interfering in a domestic issue which has absolutely no bearing on its own affairs. This is totally unacceptable behaviour. But so skewed is this debate that the Sunday Times, in reporting the Japanese intervention, forebears to point this out. Any informed, sensible commentator would do so. But here we are dealing with the British media: they are not capable of coherent, much less informed reporting on this issue. Once again, though, we see how important the "Norway Option" has become. It is absolutely key to the debate – and thereby is the one issue on which the media is silent. And that, once again, confirms what we need to know about the media. Given a chance, it will wreck any opportunity we ever had of leaving the EU. The media are not our friends.